Councillors have received an email from Mr Stephen McEvoy requesting a review of the Section 64 (water and sewerage) developer charges on his approved 45 lot subdivision at South Macksville and a copy of the General Manager’s response. Further information has since come to light regarding the history of Mr McEvoy’s land that indicates there were previous consents for a residential subdivision of his land that probably would have qualified for the grandfathering arrangement. 1 A previous owner obtained 3 separate development consents for the residential subdivision of the same land in 2005 and 2006. 4 The new DA was duly submitted and approved in 2016. The lot layouts and yield of the original development consents (pre 2012) are about the same as the 2016 approval. For this reason there is a reasonable argument that Mr McEvoy should benefit from the grandfathered contribution arrangements for pre 2012 consents on the basis that when he purchased the land the consents were in place and were intrinsically the same as his 2016 consent. Based on the principle of the grandfathering arrangement it is a reasonable proposition that McEvoy had an expectation for the same water and sewer headworks contributions as contained in the original consents. In light of this new information it is recommended that Council receive a more detailed report in order to consider the merit or otherwise of Mr McEvoy’s request. There has been consultation with the General Manager. 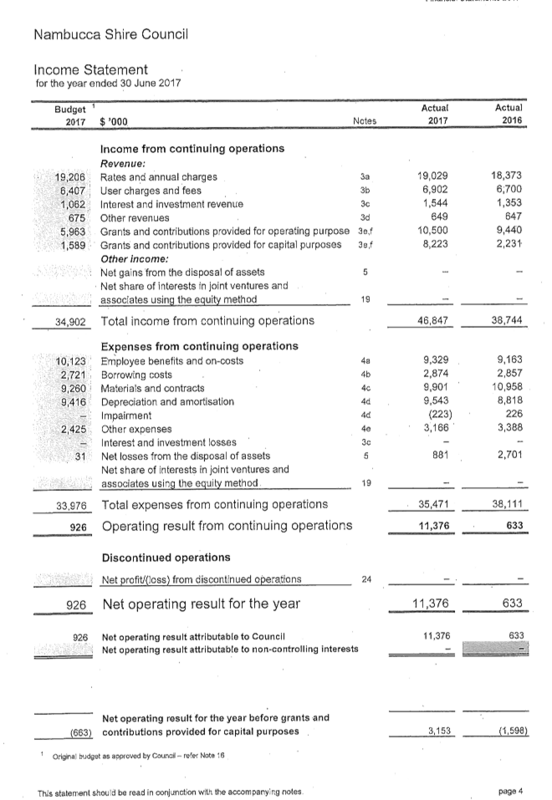 Attached are the DRAFT Primary Financial Statements referred in item 10.2 of the agenda. That Council note the Draft Primary Financial Statements and consider them in the context of the recommendation that they be referred to Audit. No options are offered. This report is an addendum to report 10.2. This late report provides the Draft Primary Financial Statements referred to in item 10.2. 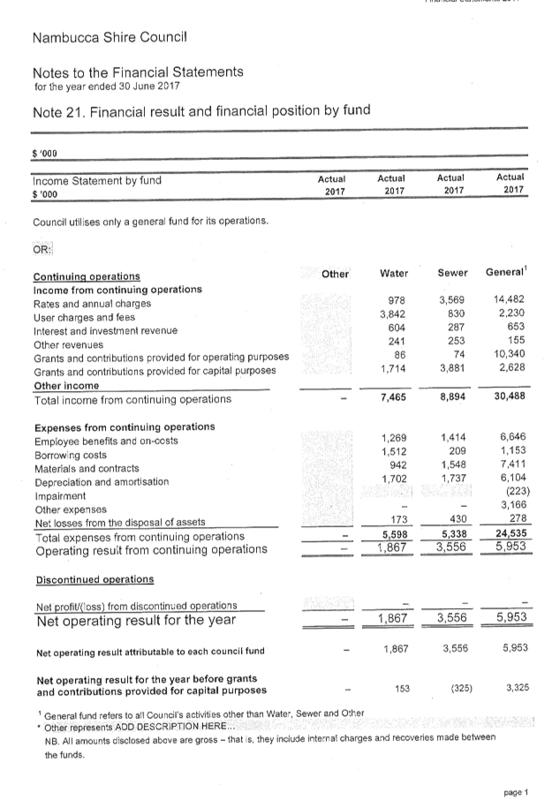 In addition two draft notes are provided that detail financial performance indicators. 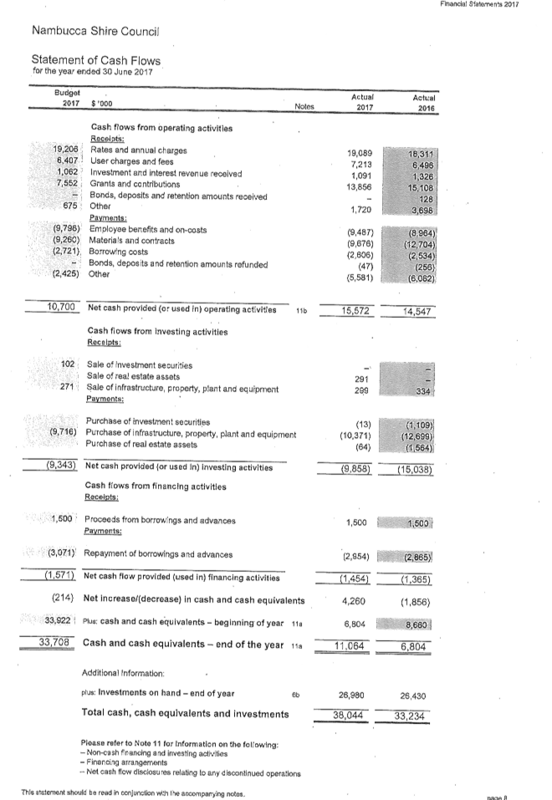 These indicators are the ones traditionally used in the Accounting Code and are not precisely the Fit for the Future Ratios; they are however very similar except for the absence of the asset management ratios. Please bear in mind that these Statements are yet to be audited and may change, it is expected that any changes will be minor. 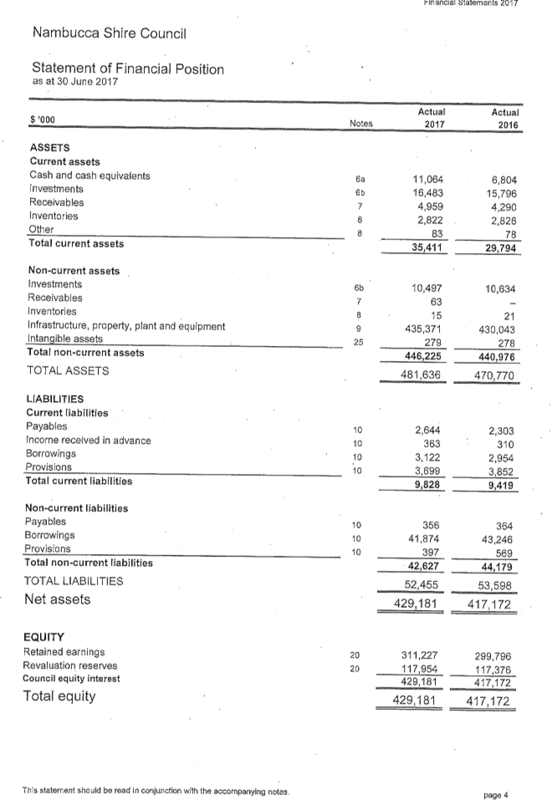 Below is some further explanation to Note 21 Financial Result Position by Fund. This is provided to highlight some points that are particular to this reporting year. General Fund has an operating surplus. This includes half of the 2017-18 years Financial Assistance Grant (FAG) that was prepaid in the 2016-17 year as per the current Federal Budget. This timing difference inflates the 2016-17 results and reduces the 2017-18 results. The reporting treatment is in accordance with the ASSB accounting standards but can be misleading. The fund is still in surplus without the additional FAG income. 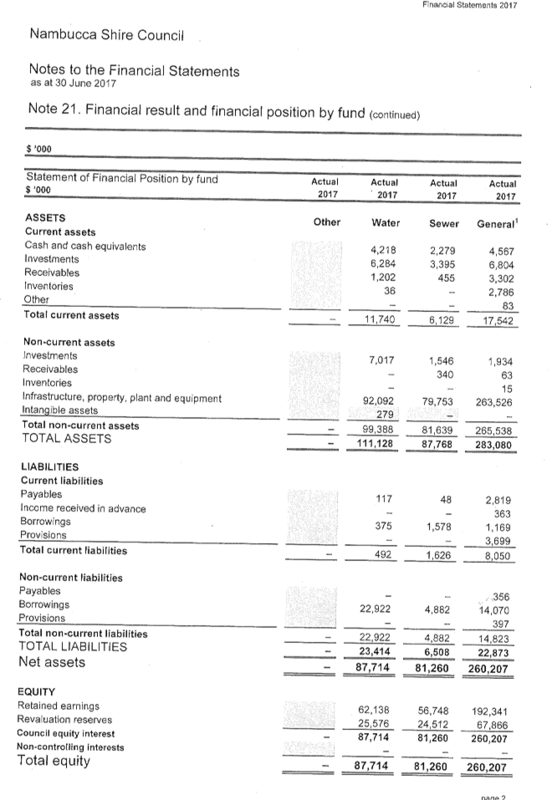 The adjusted General Fund Income Statement below and shows the impact of the prepaid FAGs. The General Fund operating surplus also benefits from the reversal of an impairment to flood damaged assets which reduces expenses by $223,000. The accounting treatment of this may be challenged by auditors, the fund remains in surplus if this was excluded from the result. Sewer Fund has an operating deficit of $325,000. The two key drivers for this both resulted from revaluation of the asset class in 2016-17. · Net Loss on Disposal of assets $430,000. This amount was made of $51,000 that where assets were renewed but still had some useful life or they were sold and the proceeds were less than the carrying value. The remaining $379,000 relates to correcting errors discovered as part of the revaluation process. 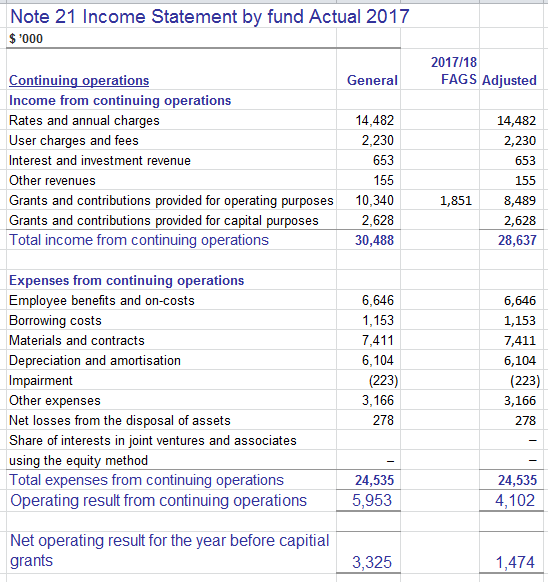 This revaluation was done by Council staff and the data was cross referenced from several sources, the assets that had not been previously recognised (found assets) appear on the Statement of Financial Position (balance sheet) however the assets that were wrongly recorded and needed to be deleted from the records are treated as a disposal and are recognised on the Income Statement (Profit and Loss). The errors are typically assets no longer in use or assets that were incorrectly identified at initial or subsequent valuations. Discovering errors in the data is common and symptomatic of assets that were buried years before it was necessary to financially account for them. It has to be assumed the data will get progressively more accurate. Fair value of sewer non-current assets was $79.8M at 30 June 2017 so the correction equates to less than 0.5%. · Increased Depreciation Expense Sewer Assets - The revaluation of assets was effected 1 July 2016 so the Sewer Fund had a full year of depreciation at the revised valuations. 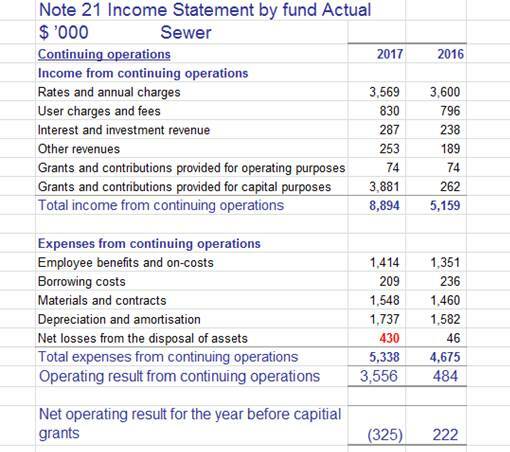 Draft Sewer Fund Income Statement 2016/17 with prior year comparatives. Water Fund has an operating surplus of $153,000. It should be noted this class of assets was also revalued in 2016-17. This revaluation was effective at the end of the year, 30 June 2017, which meant it did not change the 2016-17 depreciation expense. This was done to spread the workload associated with the revaluation. There was a $173,000 Net Loss from disposal of assets, as in the Sewer Fund this substantially arose from corrections identified as part of the revaluation. 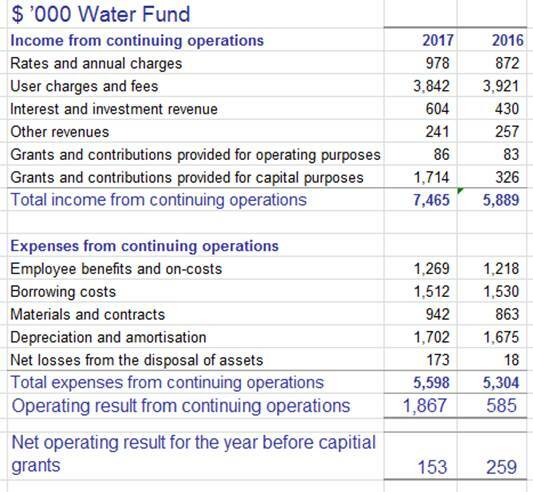 Draft Water Fund Income Statement 2016/17 with prior year comparatives. This report was deferred from Council’s meeting held on 17 August 2017 and is again presented with some minor modifications and answers to the questions raised by the Mayor. This report provides Council with a quarterly report on the Capital Works Program for the fourth quarter of the 2016/2017 financial year. The Capital Works Report is again presented for the period ending 30 June 2017. This current review reflects the fourth quarter of the 2016/17 financial year with expenditure reported to 30 June 2017. Council at the meeting on 17 August 2017 resolved to revote the unexpended funding as at 30 June 2017 in to the 2017/18 financial year. This report provides Council with a quarterly report on the Capital Works Program for the fourth quarter of the 2016/17 Financial Year. The Coordinator Strategic Planning and Natural Resources had previously reported that the $64,000.00 allocation under WO2791 for Gordon Park would not eventuate this financial year and Council had resolved to place the amount into a reserve to be used during 2017/18. · A monthly report will now be presented to Council to monitor the progress of Capital Works. · As verbally advised at the Council meeting on 17 August 2017, the tender process has now been changed to a site specific program of works from the provision of a schedule of rates. This is similar to the way Port Macquarie Council tender their works and they have provided positive feedback regarding its success. · Council is currently evaluating a tender through Vendor Panel for identified road rehabilitation works to be undertaken via a contractor / contractors. This will ensure that a substantial amount of the road rehabilitation works will be completed by December 2017. · The current road rehabilitation contract has been extended through a variation to allow an earlier completion of some works. This will ensure that all remaining works will be completed by June 2018. Mayor - Page 154 What does the partial subdivision refer to in relation to Coronation Park? The previous subdivision and sale of what was Community land was contentious. Council has not been apprised of a proposal to subdivide further. Correct: This was reported as a comment in the March and June QBR. Council was not advised of a concept proposal to subdivide further. Staff had raised the matter with the General Manager who was going to take up the subdivision concept with the Coronation Park Committee of Management. AGMES believed the Committee were aware of the potential subdivision. AGMES felt it made more economic sense that instead of replacing one or two poles, the allocation should be placed into a reserve to compliment a substantial grant which Council had been advised was forthcoming. Mayor - Coronation Park – design for retaining wall - $9400 was budgeted and according to the report $9440 was spent and the job is complete but $9440 is listed as remaining. How is this possible? Reason: Data entry by AGMES was incorrect. Mayor - Thistle Park is a revote because no one thought to conduct any community consultation or that a Plan of Management might be required. Incorrect: There was consultation with the stakeholders of Thistle Park. The original funding was to construct practice nets on the reserve and before works commenced a landscape architect was engaged to liaise with Council engineering staff and the Junior and Senior Cricket Club. The site was adjacent to a vacant section of land actually owned by Council. The adjoining property owner complained when the pitch area was being excavated as they believed they would be impacted by noise and visual pollution. They were under the impression that the vacant land adjacent to their property would never be developed. Work ceased immediately to address their concerns. A second landscape architect and engineering firm was then engaged to create a plan for the current funded works being the practice nets and future shovel ready upgrades. In hindsight, while we do agree that wider consultation would have been beneficial, it is sometimes difficult to determine the level of community consultation as in some cases the community are apathetic to proposals and, in others, the community want to micro manage outcomes of a particular project. Mayor - Adin Street footpath is 33% over budget? Incorrect Data entry by AGMES was incorrect. The total budget of $163,276.00 is made up of $134,576.00 (private works) and $ 28,700 (Council funds) committed by the General Manager towards the footpath contribution. The $27,105 is basically a profit margin on quoted Private Works that has been absorbed into Working Funds. Council quoted against the private sector and were significantly more competitive. I believe Council did remarkably well on this project, despite the constant scrutiny and delays due to the involvement of some community members, in particular, having to lay turf in the hottest months of the year which required constant labour costs for watering. Mayor - Under drainage it is noted “Project funding emanate from W2139 VOTE $95,000”. What does this mean and what is W2139? Previous work practice established a generic Work Order Number, in this case WO 2139 – Stormwater Drainage Reconstruction – Pollutant Trap and Minor System Extensions, and all projects, regardless of where they were located were charged to that one Work Order Number. This made it difficult to track projects, so the new practice is to create an individual Work Order number for each project for accountability, transparency and ease of capitalisation of multiple projects. This has been done in accordance with ICAC recommendations to minimise fraud. · Bellwood Drive drainage was 75% overspent. Why? · Old Coast Road drainage shows no % spent but was in fact 41% underspent. Why the under expenditure? 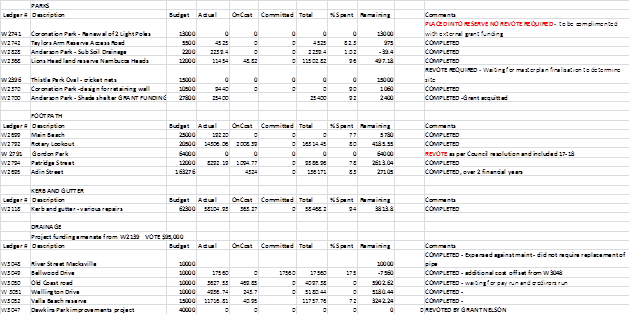 · Wellington Drive drainage again shows no % expenditure but was 48% underspent and figures don’t tally across the page. Why the under expenditure? Bellwood Drive Required a substantial replacement of the drainage pipe line. Old Coast Road Required less work as the drainage pipe was in better condition than anticipated. Wellington Drive Required repair work on a portion of the pipe line only instead of the entire line and negated the need for costly traffic control. We have now purchased a CCTV camera which allows an internal inspection of drainage to gain a better insight to the issue as to whether it is a joint issue or a collapsed pipe. This in turn will enable better costing estimates. As reported in the March QBR the Isuzu truck and a Parks and Reserves trailer were ordered in January and March respectively and both items were not supplied by 30 June. · The truck arrived 25 July cost $195,238. · The trailer cost was $15,428 the order has been cancelled and another supplier being sourced. At the March QBR the allocation for the replacement of the two Civic Service utilities was placed back into the plant reserve until the organisation review of this service area was completed. Mayor - The Isuzu truck and the trailer were ordered in January and March respectively and neither was delivered by the end of the financial year. Why were the orders placed so late in the year when the money was available as at July 1 2016? At present the replacement is based on the purchase date of equipment. There was a substantial plant replacement budget last year with a number of complicated purchases. The old practice was to buy the same whether it was warranted or not, however due to actually reviewing the items of plant and whether it “fit for purpose” required consultation with multiple stakeholders. This change resulted in a more professional approach to the purchase of plant and equipment. The entire procurement process could be improved by bringing the purchasing dates forward across the fleet. In a perfect world a central procurement area would have all the specifications ready to be released in July. Staff are presently reviewing the position description for the vacant Storekeeper position to enable the potential establishment of a central procurement area. Plant procurement takes time and the truck was actually ordered in January 2017 after being placed on Vendor Panel in November with a closing date of December 2016. A delivery period is specified by the Supplier and there was no reason provided to Council for the delay. Staff constantly contacted the supplier as was reported in the QBR report. AGMES confirms his verbal advice to Council at its meeting on 17 August 2017, that strong consideration may be given to the next truck being purchased and delivered from an external source outside the Shire. The trailer supplier has been notified that no further business will be undertaken with this company. As reported in the March QBR the carpet for the Shire Chambers was deferred due to the work required on upgrading the PA system. An Order was issued to the electrical supplier in mid-March to design the electrical upgrade and supply new switchboard. The supplier has liaised with Councils electrician but could not supply and install the switchboard before the end of the financial year due to other electrical issues identified through further investigation at the depot and the allocation will require a revote to compliment the funding within the 2017/18 allocation. The new water and sewerage shed was completed at the 30 June, the final invoice was outstanding and carried forward, the painting of existing sheds at the depot to tidy up the sighting from the new highway (included within the same allocation) was not completed and a revote is required to finalise the project. The toilets upgrade for the RFS shed did not occur due to the not being able to source appropriate quotes from a builder. Mayor - When were orders/ tenders – whatever – placed for the water and sewer shed? Why was it not completed in time to be invoiced by 30 June? Is the exterior painting of the other depot sheds part of the above shed budget? There is no separate listing. Why was this work not completed? Orders for the sewerage shed and for additional works on the existing shed were placed on 15 May and 18 May 2017 respectively. The contractor advised that all work could be completed and invoiced by 30 June 2017 as did the contractor engaged to paint the sheds. By leaving the works until late in the year there was no margin for delays. The quoted price for the shed was well within the budget so it was decided to engage a professional painter to paint the other external sheds within the Depot so that all sheds in the Depot had a uniform colour. As the Works Depot will be highly visible from the new highway, a professional and well maintained area will reflect positively on Council. Unfortunately this work had commenced but was not completed by the end of June. The reality is that the works were left until too late in the year. The organisation restructure within Water and Sewerage and consequent staffing and recruitment issues meant that there was some consultation difficulty in deciding what was going to be the best option for the shed layout due to increased work commitments by all remaining water and sewerage staff. To prevent this happening again, one staff member will be responsible for the delivery of the 2017/18 Works Depot program. Mayor - The RFS toilet upgrade was not completed because we couldn’t “source appropriate quotes from a builder”. It is difficult to comprehend that in twelve months we couldn’t find a builder who could build a ….toilet. The RFS budget is handed down in December each year some six months into our capital works program. There were 2 budget items for North Arm Station identified by the RFS Zone Manager, $10,000 for construction of the North Arm driveway and an additional unfunded $10,000 for the North Arm toilets. As advised in an e-mail dated 8 September 2016, the latter funding was to be confirmed. No further communication was received until 3 May 2017 when it was mentioned that the driveway and the toilet would need to be finished by the end of the Financial Year. Despite there being multiple emails regarding the concrete slab throughout the year, the May notification from the RFS Zone Manager to AGMES is the first confirmation regarding the toilets and a budget allocation. In effect there were only 2 months to organise construction plans and builders etc to ensure compliance with a disabled access. Incidentally, this was just 2 weeks before Council’s Technical Officer – Assets in charge of buildings and halls etc., retired and although Council’s recently appointed Engineering Designer drafted a design, we were unable to obtain quotations and engage a qualified builder prior to end of financial year. · Little Broughys Bridge was not completed with bridge decking arriving on the last day of the financial year. The bridge was constructed in the first three weeks of July and the side track and approaches are outstanding – revote to complete is $61,572.00. · McHughes Creek Bridge was completed but invoices for the prefabricated bridge components were not received from the supplier by close of end of financial year payments. The approaches and guard rails are outstanding –revote is $140,076.00. · Bradleys was completed with exception of the side-track removal and installation of guardrail revote is $78,554.00. Council has provided the 2017/18 bridge program to the contractor and placed an order for the first two bridges in the first week of July to ensure there are no further supply issues. Mayor - Bradleys is listed as completed except for guide rails and the removal of the side track. There is no mention of the approaches being unfinished. At the time of writing the QBR report Council had programmed the completion of the sealed approaches before its release. Due to an opportunity to save considerable time and cost savings on the Scotts Head Road construction job, a decision to reschedule the works was made. This put the expected sealing of the approaches back approximately one month. We received minimal enquiries as the road has low utilisation and the gravel pavement loss is minimal. Mayor - When were the components for Little Broughys, McHughes Creek and Bradleys actually ordered? Details of the bridge replacement program and schedule were provided to the contractor of the bridge components in July 2016 and were subject to final designs. 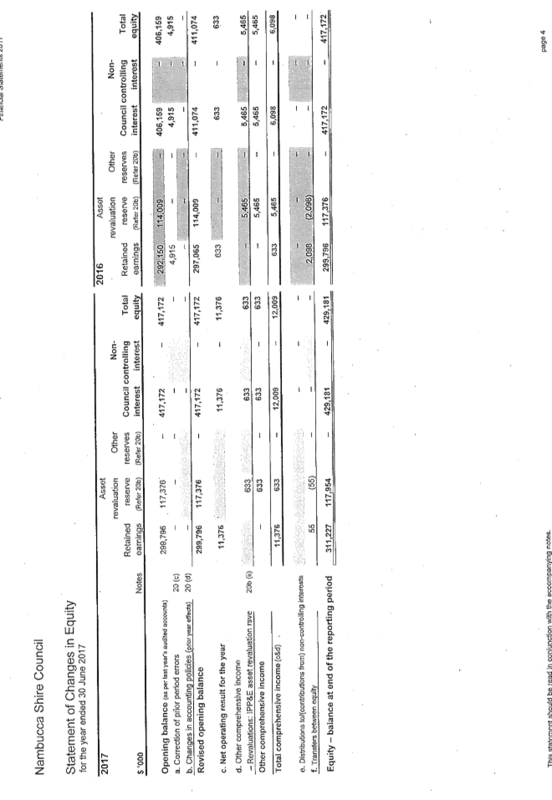 However the only design variation was the length and type of piles configuration to be driven or placed. · Little Broughys Bridge components. This was to be the last bridge constructed within the program; and an order was verbally placed on 11 January 2017 and an official order sent 1 May 2017 with the contractor confirming delivery in the first week of June. · McHughes Creek No.2 Bridge components were ordered 11 January 2017 – delivery March/April 2017. · Bradleys Bridge components were ordered 14 November 2016. Council staff were in constant contact with the supplier who had programmed our works into their construction schedule to align with crane hire. Our supplier was advised verbally and via email that an order was forthcoming, but actual purchase orders could not be placed until the design was finalised because the price of the piles being dependent on length and size. Considering Council had decided to move towards concrete bridges for last year’s program, staff still managed to deliver a substantial amount of the program, despite there being no Design Engineer for 6 months of the year and constant delays from the supplier. Mayor - Bakers Creek Bridge was completed at a cost of $47,833 over budget. Why? The original estimate was for a timber structure and the over expenditures had been reported through the December and March Quarterly Business Report. This was a large 3 span bridge and some 15 metres above the waterline constructed by Council day labour. Costings were proportioned substantially based on what was experienced during the trial concrete bridge project of Lovedays Bridge, and the differance in size. In hindsight, we did not provide sufficient allocation for a substantial side track detour and additional crane hire required to lift the members into place and pile driving. This was further impacted by a flood event during the construction necessitating a rebuild of the detour track. Yes, the project was over budget, however, the entire over expenditure was contained within savings on other bridge projects within the program. Mayor - Boat Harbour Bridge was budgeted at $474,000, and came in over budget yet we have $52,792 remaining? Not possible. Agreed Data entry by AGMES was incorrect. The funds should have shown a negative value indicating an over expenditure as reported in the December and March QBR. The project was over budget due to flooding, a rebuild of the side track and a number of approved variations to the tender. This was offset by savings across the entire bridge program budget as a result of new techniques developed by staff. Mayor - Degraas Bridge was budgeted at $105,000 but was completed for $51,421 – less than half the budgeted cost. Why? Gorleys Bridge was completed almost 50% under budget. Why?Garretts No. 2 was completed for 38% under budget. Why? Reason: Council staff developed an in house design and process for abutments for smaller bridges saving substantial costs on each similar project. This was a great solution from staff in how to improve our techniques and save time and money for Council. Mayor - Little Broughys - the 0.04% expenditure to date can’t be right. Should be around 75%. The gravel resheeting program was completed. The program was identified to be completed by 30 June or the first week in July, and it is disappointing to report that a number of projects were not completed until the third week of July requiring a revote of funds. All works have now been completed and invoices are currently being checked against the quantity of works on the ground before being paid. Staff also withheld some payments due to potential warranty work required. At the time of letting the works, the contractor provided Council with a time frame for completion of works by 30 June, and was to supply two separate teams to address the quantity of work; however one team had been held up on another job outside the Shire and arrived a week late. The contractors experienced various mechanical breakdowns during the period as well as some latent ground conditions (even though geotechnical investigation and design was undertaken) and the contractor further lost time to wet weather which has seen the program roll into the third week of July. Once the program entered the second week of July the second team was sent away due to other contractor commitments and the main team stayed to complete the program. Council advised the contractor that they had also missed Greenhills Road which was on their program whilst in the area and they had to return to complete the work towards the third week of July. To ensure that revotes do not occur in the future, part of the 2017/18 program has already been prepared and a portion of the works let to the contractor as a variation of the existing contract to continue into the first quarter. A second contract is presently being advertised which will ensure all work will be completed by the third quarter. As previously reported, some of the projects have a primer seal placed onto the pavement and an asphalt or final rubber seal required to be placed in September and October, therefore whilst some projects will be invoiced for the contract work done, they may appear under the budgeted amount and the remaining expenditure across the work orders is required to be transferred into the 2017/18 program to complete the final surface course. Mayor - Are we completing the originally programmed lengths of road down for work or are we cutting back on some of the lengths to accommodate inaccurate costing? Generally, yes. However, we now design the pavement and do full geotechnical work and the pavement or works may be reduced to ensure a quality project is delivered against the dollar value available. This has resulted in some road lengths being reduced or extended, but resulting in a far better quality product and long term sustainability. In the past it was expected that the budget would extend further, but resulted in substandard projects requiring rework. All programs are more accurately costed by gathering the pavement investigation information, service locations and determining an accurate scope of work. 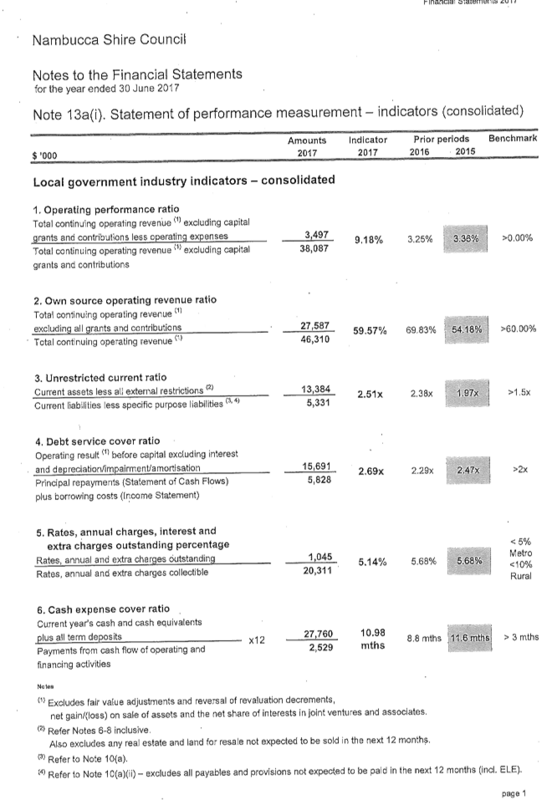 While some lengths are reduced this may not be attributable to inaccurate costing. The scope of works may be amended to provide the most sustainable outcome against $ value and in some cases may even be extended when warranted. Mayor - I can understand some issues trying to cost bridges accurately when we have moved to a new concrete construction method, but it seems there are issues in costing sealed road works as well. Shelly Beach Road – listed as completed for less than half the costed amount. Why? Shelly Beach Road and Parkes Street were a combined work project and it was difficult to determine the start and finish of each sector. When added together both projects were completed within the budget allocation and under expended funds were reallocated to other projects within the same program. Mayor - Only one of four heavy patching jobs was completed. Why? The heavy patching program was reduced to small areas only and the other funding was included as part of the pavement rehabilitation program which was addressed above. Mayor - Dickson Street was completed at 141% over budget. Why? We are currently waiting on a Credit Note which will reduce the cost by $5,000. This project had a significant change in scope as the program information matured, and while over budget, costs were contained within the overall allocation for these works. Mayor - George St. Significantly overspent due to failures. Did we do geotech work? Were failures due to quality of material or workmanship or due to the nature of the natural subbase? Did we do any geotech testing before the work was commenced? Yes, however the geotech work did not reveal poor subgrade at the locations of the testing. The project was costed utilising defect information that has since seen significant changes. The road pavement also failed further during the period between the initial project scoping and the allocation of works. · Hahn Close – not listed as a revote but it is. · Knight Close – completed 44% under budget. Why? The road pavement had deteriorated from the time of project scoping to project allocation so areas that were due for resealing could not be resealed and required rehabilitation as the preferred treatment. Mayor - Gumma Rd is not listed as a revote but it is. Incorrect: Gumma Road is not a revote and is over expended by $13,000. The over expenditure has been offset within the program. Mayor - Bellingen Road – the work does not appear to have extended as far as was originally advised. Did we reduce the proposed length of work? Bowraville Bellingen Road. The contractor took significantly longer than estimated. I recall when we awarded the tender that we were told that contractor was preferred because they would use two crews and have the work done in what I thought at the time was an extremely short time frame – something like two months? What happened? Council may recall the significant landslips in this area and the scope of works was originally $16M yet we were only awarded $1M. It was found that some of the design for this project was not able to be constructed due to continued slipping from the time of initial project scoping to the time of construction. The tender applicants essentially priced and scheduled their work based on a design provided by Council. A variation to the extent of works was endorsed with additional drainage works as part of the contract. As reported in the March QBR the work was put back to March to allow for fire season, the contractor experienced issues with respect to continued slippage and completed the works in accordance with the tender. The revote of approximately $500,000 was forecast in March with the intent of Council using these funds to place gravel on the pavement. There is an area that is still prone to slippage which was unforeseen due to the amount of debris onsite and we now need to engage another contractor from Council’s tender panel to undertake soil nailing over a 50m area to stabilise the embankment anticipated to be around $220,000 and renaming put into the pavement surface. All costs will be absorbed within the remaining budget allocation. Mayor - Is it correct that Regional Road Funding is underspent and the under the funding agreement unspent funds have to be returned? If this is correct, why were we underspent? Correct The regional vote was unexpended by $52,000. Generally, the RMS will allow Council to retain the funds or potentially reduce next year’s grant by the same amount. These funds were for line marking and signage maintenance and not capital expenditure. We have written to the RMS seeking their approval to retain the funds and not reduce the 2017/18 allocation. Reason: Underspend occurred due to the streamlining of payroll services by removing the reporting of coordinators time through payroll to a percentage of on costs based on information provided by AGMES to Finance Manager. However, these are only allocated following a finance QBR reports and in this case applied in July of the final quarter which it is too late. We are not prepared to jeopardise our reputation with the RMS by last minute journals or spend on other areas. Mayor - We appear to have taken Regional Roads funding off Rodeo Drive to complete Scotts Head Road (also a Regional Road) but we have not spent our allocation of Regional Road money and have to give some back????? Reason: As advised above, the under expenditure is not able to be used on capital works. The capital works on Rodeo Drive were reduced to compensate for the over expenditures on Scotts Head Road due to latent ground conditions which were reported in the March QBR. Mayor - In relying on contractors to complete sealing jobs in the last month of the financial year with no leeway for wet weather, breakdowns etc. not only are we courting revotes but are we confident in putting contractors under pressure to have work completed and invoiced before the 30 June that we are getting best quality work ? The contractors provide a Quality Assurance service and Warranty for the work. Mayor - Sealing work is a major component of our budget and yet we seem to be continually spending the allocated funds in the very last quarter of the year. Is it not possible to arrange for this work to be done earlier thus avoiding revotes or giving the council the opportunity to reallocate funds to another project if there is good reason to believe the money won’t be spent on the allocated task? Yes. Reseals are best undertaken in the summer months, however, the sealing in the 2016/17 financial year was mainly for construction and rehabilitation works. The 2017/18 planning program has already been finalised with the majority of the works scheduled to be completed by December 2017. The delay in 2016/17 was as a result of the tendering procurement procedure. We made first contact with Local Government Procurement regarding tendering the 2016/17 program of works on 4 November 2016, (Q2). LGP then advised of the necessary information and steps required to facilitate the tender process. As this was a new method of tendering, it took some time to gather the tender information and documentation so that the tender could be advertised. The Tender was not finalised until the first week of May (Q4) and the contractor was made aware that the program must be finalised before the end of financial year and the Contractor provided assurance. Council’s current organisation structure does not allow the luxury of a single source procurement officer and tenders are initiated and managed as part of normal duties. However, Council will benefit from this new tendering methodology by being able to repeat the same tender process in June/July for future financial years. Council struggles to attract appropriate staff to vacant positions. Engineering staff were burdened with additional workload while we were without a Design Engineer for 6 months and following the retirement of the Technical Services Officer – Assets (which has still not been replaced). This naturally impacts the delivery of projects. Mayor - There appears to be significant delay between our own staff preparing subbases and the contractor arriving to complete sealing. For example it has been months since the work (heavy patch) at the corner of Willunga Ave and the Pacific Highway was done and a dust seal/primer seal was put down. This has now begun to break up. Is it intentional/desirable to leave it this long or are we having difficulties co-ordinating our work with contractors? Yes – it was intentional to place a primer seal over the pavement and monitor it prior to finalising the pavement. The issue for the public is the perception that Council have only done a half job because it is not finished. In the past the pavement repair at this location has failed within three months and rework was required at a substantial greater cost. Macksville and the area around Bellwood are the most notable areas with very poor subgrades. We now do substantial geotechnical investigation which allows a better pavement design but will still leave the pavement with a primer seal in these areas for a period of time to monitor the repair. No - it is not a coordination issue with contractors. The April 2015 program - The remaining projects on North Arm landslips were completed. The June 2016 program - The funding provided for the June 2016 Natural Disaster is able to be expended over two financial years, it was anticipated that the entire program could have been completed by 30 June 2017 but was hindered by lateness of the RMS approval of the grant allocation. The payment of the grant funding from the RMS is via a monthly expenditure forecast completed by Council. As projects are completed the claim is submitted at the end of the month and the RMS then reimburses Council for the approved expenditure. There are three projects under the June 2016 event that Council have provided a forecast of not being completed within the 2016/17 financial year which is not an actual revote of funds as Council has not received the funding. · Dyers Loop $39,753 – contractors in progress at 30 June. · Main Beach $28,480 – high tides hindered the placement of rock and the remainder of the works will be undertaken in conjunction with the coastal grant funding. · South Arm $34,994 – work was completed but invoice has not been received from the contractor at the time of end of year closure for accounts.